A 3,700-year-old Egyptian burial chamber containing the remains of a ‘Pharaoh’s daughter’ was found south of Cairo at Dahshur's royal necropolis. Archaeologists have discovered “a cachette of non-royal mummies of men, women and children buried in catacombs eight metres below ground level in the desert neighbouring the bird and animal necropolis at the Tuna Al-Gabal archaeological site” in Egypt. Two Egyptian men illegally digging for antiquities were killed when their house collapsed. And the Egyptian government has increased the penalty for antiquities theft for a maximum of a life sentence. An international team of experts met in Cairo to determine how best to transport King Tut’s artifacts to the new museum. Egypt has begun to register its Jewish sites and antiquities. An exhibit of recently discovered artifacts is now on display at the Luxor Museum. Turkey is planning to restore and open the stadium of Perga. Carl Rasmussen recently visited a new archaeology display in a station for the metro tunnel that connects Europe and Asia. The city of Rome has begun restoration works on the Mausoleum of Augustus with the plan to open it to tourists by 2019. John DeLancey shares a new video of a recent performance of “Jerusalem of Gold” by the Portney Brothers and he explains the song’s significance. The diet of Jerusalemites in the first century AD was primarily sheep and goats, followed at a distance by cows and chickens. “Methuselah,” the date palm tree sprouted from a 2,000-year-old seed, is now 12 years old. I’m traveling much of the month of June and will post as I am able. Roundups will probably resume in July. A new study suggests that the Philistines brought their pigs with them when they sailed to the coast of Israel. The second issue of the Tel Aviv University Archaeology Newsletter has reports on projects at Masada, Kiriath Jearim, Timna Valley, City of David, and more. David Hendin reports on the most significant numismatic discoveries in Israel in recent years. Wayne Stiles looks at lessons to be learned from sieges in the Bible. Charlie Trimm explains how soldiers relieved themselves while in battle. Lexham Geographic Commentary: The Gospels is now available as a standalone purchase in Logos. The Acts through Revelation volume is in pre-order status. A new database identifies 20,000 archaeological sites at severe risk of destruction. Access the Collections is a new feature of the Oriental Institute website to encourage visitors to explore their photographic and document archives. Hazor VII: The 1990–2012 Excavations: The Bronze Age, edited by Amnon Ben-Tor et al. We’ll have more stories in part 3 of the roundup tomorrow. Archaeologists have revealed new evidence for the Roman destruction of Jerusalem in AD 70 from the excavations of the road from the Siloam Pool to the Temple Mount. The tomb of an unknown saint has been unearthed at Hippos. A stone slab with two indentions was used to start fires in the Neolithic period. The Associates for Biblical Research have completed Week 1 of Season 1 in their excavations of Shiloh. A network of caves and tunnels at Khirbet Burgin in Judah’s Shephelah has been opened to the public. An archaeological garden has been opened in the Davidson Center south of the Temple Mount of Jerusalem. A study to be published in Palestine Exploration Quarterly observes that the large number of reservoirs made Jerusalem unique in the Second Temple period. International Museum Day has passed, but this is a handy list of museums in Israel. The Temple Mount Sifting Project met their first goal of 250,000 NIS and is now working to a second, much larger goal. Aren Maeir shares some photos from the opening of an exhibition of discoveries from Gath (Tell es-Safi) in the Bar Ilan University Library. Ferrell Jenkins recently was able to visit inside the Dome of the Rock and take photos. He shares some. A $14 million elevator will be built at the Western Wall Plaza to allow elderly and disabled to go to the Jewish Quarter. A Russian lawmaker vacationing in Israel drowned in the Dead Sea. Accordance is having a big sale on many excellent archaeological and geographical resources through Monday. 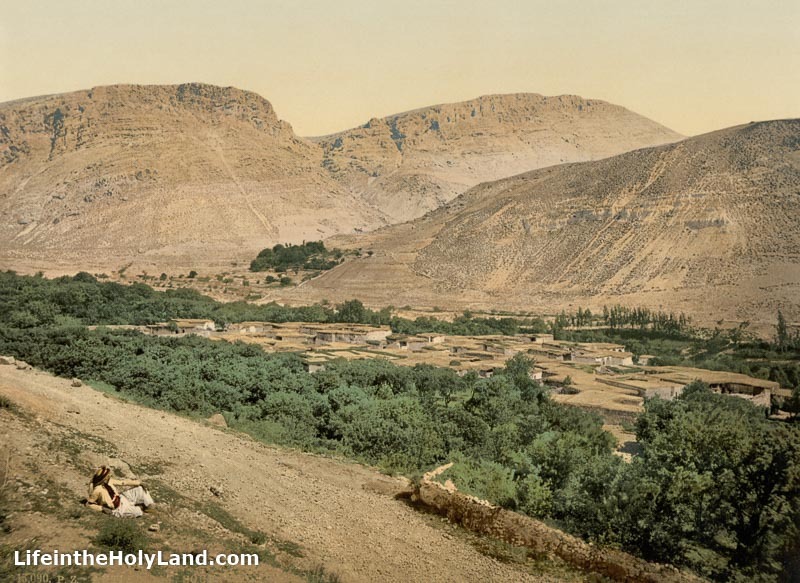 This series of posts examines the historical reliability of the New Testament books of Luke and Acts by comparing these books to other ancient textual sources and the archaeological record. In addition, background information on key elements of the text is also given. One person referred to in Luke 3:1-2 is "Lysanias, tetrarch of Abilene." Lysanias is one of the more obscure persons mentioned by Luke with one extra-biblical reference being an inscription, dated to the reign of Tiberius, found in the area of Abilene that reads, ". . . a freedman of Lysanias the Tetrarch, having made the road, erected the Temple" (Journal of the Royal Geographical Society of London, V. 20, p. 43). The area known as Abilene was a small district on the eastern side of the Anti-Lebanon mountains that gets its name from Abila, its chief town. 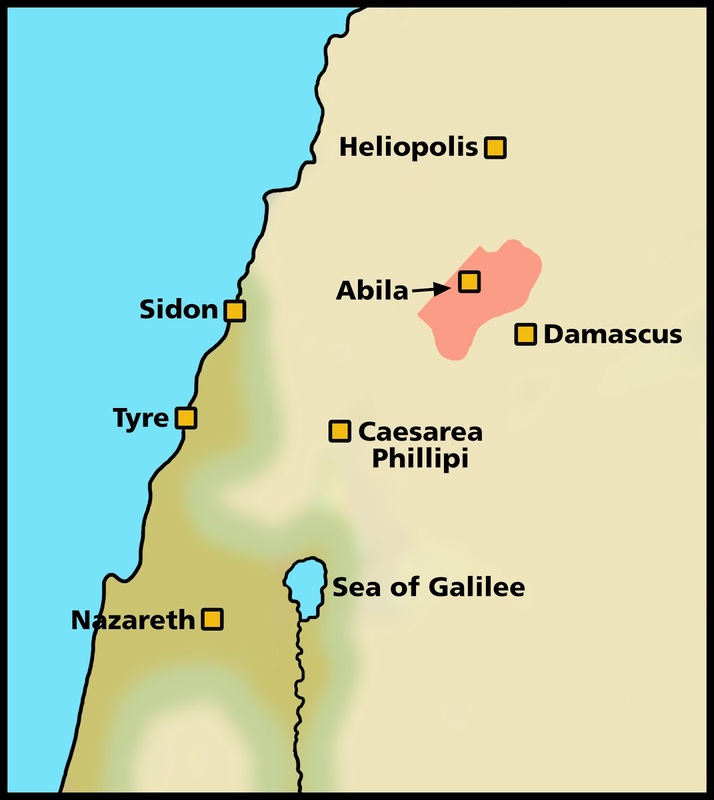 The town of Abila shown on the following map was located on the route between Damascus and ancient Heliopolis (modern Baalbek, Lebanon). Today the village of Suk Wadi Barada marks the spot of ancient Abila. It is situated in Syria, about 10 miles northwest of Damascus. The following photochrom image was taken in the 1890s of the village. For a brief discussion concerning the dating of the Lysanias inscription noted above, see chapter 7 in F. F. Bruce, The New Testament Documents. As time permits, a future post may deal with the possibility that there was more than one ruler with the name "Lysanias" connected to the area of Abilene (Abila). 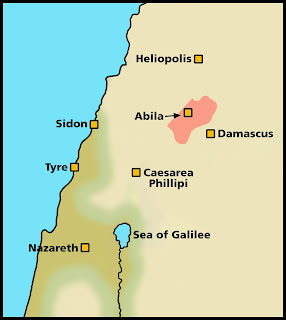 By way of note, the Abila of Abilene that is tied to the account in Luke is distinct from another city by the same name located in the Decapolis to the east of the southern end of the Sea of Galilee. Further, John Brown University is now in the process of excavating Abila of the Decapolis as described at this link. For similar correlations between the biblical text and ancient sources, see Bible and Archaeology - Online Museum.